Did you have a baby in the NICU with Neonatal Opioid Withdrawal Syndrome (NOWS) and Neonatal Abstinence Syndrome (NAS) due to licit or illicit drug use? 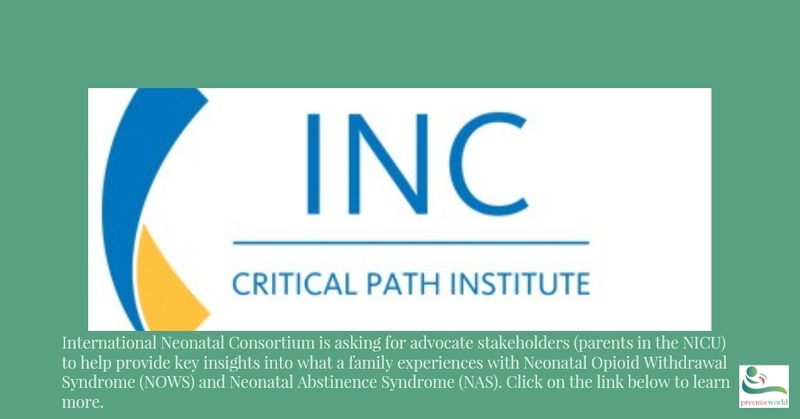 If so we have a special opportunity for you to advocate for families going through this exact experience going forward by sharing your story and providing keen insights to help INC provide better information to families, better protocols to NICUs worldwide and more. PreemieWorld was approached by officials that run the International Neonatal Consortium for an opportunity that affects NICU families, preemie or full-term. They are asking for advocate stakeholders (parents in the NICU) to help provide key insights into what a family experiences with Neonatal Opioid Withdrawal Syndrome (NOWS) and Neonatal Abstinence Syndrome (NAS) due to licit or illicit drug use by the mother and to best help the babies and the families through this experience. This is a judgement-free zone for you to advocate for families like yourself going through this in the future. It is a powerful moment for you to come out of the shadows of a stressful and painful experience and know you are respected for sharing your struggle and that of the many families that go through this each day, week, and year. You are not alone and you could do incredible good for so many going forward. What kind of reduction in treatment would be meaningful for you? What aspects of a clinical trial would make the trial more or less appealing to you if you’re asked whether you want to enroll your newborn? Would you want to know about clinical trials before the baby is born? What are your biggest concerns with treatment for NOWS/NAS and how can we address them with research studies? Travel: The organization will pay travel expenses for up to 2 advocate stakeholders to attend. INTERESTED? : Please privately and confidentially contact Deb Discenza at deb@preemieworld.com directly. PLEASE SHARE!!!! If you don’t qualify but know someone that might be interested, please share this post – thank you!